It is June, when it might be presumed that the business of academic life is winding down as students, faculty and staff ready themselves for summer vacation. This is simply not the case, however. I write this piece in between meetings, grant applications, research, writing commitments, and numerous looming deadlines. And I am by no means the only one, if only judging from my twitter feed. Although this could all be chalked up to the nature of scholarly life, the speed within which many historians and other academics work may not be so innocuous. By recognizing this, I am by no means articulating a new idea. In late May, Sean Graham interviewed one of the people who are helping raise concerns about this trend towards speed during episode 85 of ActiveHistory’s History Slam Podcast. 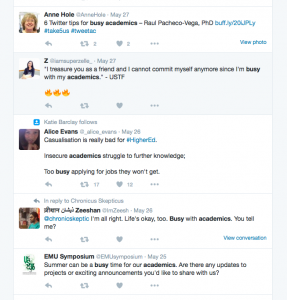 Alison Mountz is one of a growing number of academics who are beginning to argue for “slow scholarship”. In a 2015 article, Mountz and eleven other co-authors discuss the “acceleration of time in which we are expected to do more and more.” Whether it be publishing, teaching, grant writing, administration or simply the pressure “to stay on constant alert through demands of social media,” academic life is increasingly being shaped by a mounting number of tasks through which we are deemed productive, or not. This, the authors argue is “part of the ongoing restructuring of the neoliberal university,” that includes “reduced state funding, increased contingent labour and the elimination of programs,” – a phenomena which others have also written of both within and beyond academia. While attending Congress 2016 two weeks ago, I noticed that although the concept of slow scholarship was not officially represented in many panel themes, the idea was mentioned, or at least alluded to, during both conferences I participated in: the annual meetings of the Canadian Disabilities Studies Association (CDSA) and the Canadian Historical Association (CHA). When discussing history blogs during one roundtable, we questioned whether or not social media’s growing prevalence in academia may be adding to the ever-growing demands being placed on emerging scholars. In contrast, could blogging instead contribute to the movement of slow scholarship by allowing historians to think through their research over time within a much larger public conversation? In another panel, Sarah K. Loose pointed out that oral history can be a powerful tool for social change and community-engaged research that brings to the forefront marginalized voices that would otherwise be left unheard in academia. Yet how do we establish the long-term relationships that make such histories possible and productive if scholars are constantly being pressed to produce rapid research outputs? Might the priorities of oral history and slow scholarship coalesce? In another panel, this time at the CDSA, slow scholarship was again invoked as a method of challenging norms within academic culture – norms that dictate speedy results over self-care, disdain career interruptions, and marginalize those who do not operate at the rapid pace that universities demand from the scholars they hire. At a moment in which many claims of diversity and inclusion within academic institutions are ringing hollow, slow scholarship may thus be one means by which academics from all walks of life and career paths can reclaim the space of the university. Indeed, how can we speak of efforts to prioritize diversity and more equal hiring practices when the culture of speed that is too often assumed to be inherent to scholarly life, actively contributes to the persistent exclusion of those who still largely remain at the margins of the profession? It is arguably the less-than-privileged that can therefore benefit most from a purposeful move to slow scholarship, whether women (especially mothers), sexual, gender and racial minorities, people with disabilities or those from the Mad community. To be clear, this broad spectrum of individuals is more than up to the task of academic life. That is not the problem. The problem, rather, is that the personal and collective labours of many individuals in these communities are too often devalued in a system that seeks to numerically order and rank a series of rigidly defined scholarly endeavours. Conceived of in this light, slow scholarship is therefore not an extension of the privileges provided to a few, but a collaborative and distinctly political act of resistance. Alison Mountz, et. alia, “For Slow Scholarship: A Feminist Politics of Resistance through Collective Action in the Neoliberal University,” ACME: An International E-Journal for Critical Geographies (2015): 2-24. Mountz, 3; Sheila Slaughter and Gary Rhoades, “The Neo-Liberal University,” New Labor Forum 6 (2000): 73-79; Yvonne Hartman and Sandy Darab, “A Call for Slow Scholarship: A Case Study on the Intensification of Academic Life and Its Implications for Pedagogy,” The Review of Education, Pedagogy and Cultural Studies 34 (2012): 49-60; Maggie Berg and Barbara Seeber, The Slow Professor: Challenging the Culture of Speed in the Academy (Toronto: University of Toronto Press, 2016). Thank-you for this wonderful and thought provoking discussion. I have been thinking about this for a while now as well regarding the use of audio archives as historical sources. The practice of listening to each audio tape for transcription or just ‘logging’ forces the researcher to slow down and focus on one central thought/activity. If historians are to be digital humanists and promote thoughtful and meaningful scholarship, we must also encourage and exemplify the skills where ‘less is more.,’ rather than big data crunching as the goal. Strongly agree. I’ve been interviewing some of the same genocide survivors for more than forty years, and we haven’t stopped learning together. I tell my students that the obsessive, word-by-word, sustained and deepening conversation approach was specifically intended as an act of resistance against the culture of speed–instant messaging, instant info, caffeine jags,amphetamines for “performance.” Most students appreciate the chance to slow down, reflect, listen. In the meantime, keeping people “busy” is one way to keep them politically impotent. And that, in itself,makes genocide more likely or certainly less protested/resisted. Thanks for this, Beth, & for the links you gave. Mountz’s claim that our fast pace is a result of the need to constantly move on “to the next product that ‘counts’ to administrators” is undercut by her reference to the “demands of social media.” Demands of social media?? There are good reasons to get engaged in social media, some even scholarly reasons, but to suggest that doing so has somehow become mandatory for scholars, even imposed upon us, is ridiculous if not objectionable. If advocates of slow scholarship really want to slow things down, a renunciation — or at least rationing — of the fastest of fast scholarship would seem a natural place to start.